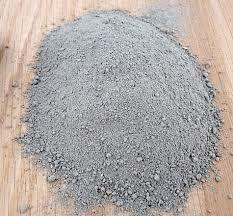 Cement is a mixture of fine grey powder of calcium silicate and calcium aluminate. While manufacturing cement, the limestone and clay are first crushed in crushes and then grinned into powder.That powder mixed with water to obtain a paste is called slurry. While heating slurry in rotating kilin in 1600 degree Celsius, then it forms the red colored pea sized balls of calcium silicate and calcium aluminate called cement clinkers. Note: 2 to 3% gypsum is added to cement to increase its setting time. It is used for making houses, buildings, roads, etc. A thick paste of cement, sand (1:3 ratio) and water is called mortar. It is used for plastering walls and joining bricks, stones, etc. A mixture of cement, gravel, coarse, sand and water is called concrete which is used for roofing and flooring. Reinforced Concrete Cement (RCC) is a mixture of cement, gravel, sand and water which is present in the framework of iron rods. It is used for making pillars, roofs of buildings, bridges, etc. Paste formed by mixture of powdered form of the limestone and clay along with water to obtain a paste is called slurry. The red colored pea sized balls of calcium silicate and calcium aluminate formed by heating slurry is called cement clinkers. Cement is used for making houses, buildings, roads, etc. What is Plaster of peris? Give its molecular formula. Write its one use. Calcium sulphate is called plaster of peris. The molecular formula of calcium sulphate is CaSO4. It is used to make casts for broken bones. What are the main raw materials for the preparation of cement and soap? What happens when a little amount of lead monoxide is added before heating the ingredients of soda glass? The main raw materials used for the preparation of cement are calcium carbonate (CaCo3) and a special kind of clay (Al2O3SiO2) and fat or oils and hydroxide of sodium or potassium are the raw materials for manufacture of soap. When a little amount of lead monoxide is added to the ingredients of soda glass, lead silicate is formed. This is also known as flint glass or lead crystal glass having high refractive index. What is the role of gypsum added to cement clinker? Gypsum is added to cement clinker to increase the period of setting cement and to make convenient to use the cement. Cement is the fine grey powder of calcium silicate and calcium aluminate which becomes hard and strong when it is mixed with water and left for sometimes. The mixture of limestone (CaCO3) and special type of clay (Al2O3.SiO2) is crushed into powder forms with the help of grinder and is made paste by mixing some water. The paste is heated into the rotatory kiln up to 1600°C to get red colored small size of balls which as crushed with 2-3% of gypsum into powder forms. Thus, cement is prepared. What is meant by cement clinkers? When the cement slurry is heated into the rotatory furnace up to 1600°C, the molten mass and unmelted mass is mixed together to give small red colored pea-sized balls called cement clinkers. Give any two differences between quick lime and slaked lime. It is prepared by burning of calcium carbonate. It is prepared by reacting the calcium oxide with water. It is hydroxide of metal. How much percent gypsum is added in cement to increase its setting time? Reinforced Concrete Cement (RCC) used for ______. What is the full form of RCC? A mixture of fine grey powder of calcium silicate and calcium aluminate is called ______. Any Questions on 'Cement '?